Long lines of patrons have been eager to buy cookies from this very special troop. For Girl Scouts, selling cookies is one of the most exciting times of the year. But for one New York City-based troop, this cookie-selling season has been extra special because its their first — and it wasn't easy to just set up shop anywhere. The Girl Scouts in Troop 6000 all live in homeless shelters around the city. It was formed in 2017 with help from the city’s Department of Homeless Services, and it is the first in the U.S. dedicated to serving homeless girls and women. From the beginning, the troop has been trying to sell cookies to raise money, but organizing cookie delivery and safety for the girls proved to be a big challenge. “When living a transient lifestyle, it’s not a convenient place to be thinking about cookie logistics,” Meredith Maskara, CEO of Girl Scouts of Greater New York, told TODAY Food, pointing out that, for many girls in New York, both storage and transportation are issues for families without garages or cars. Little Brownie Bakers, a division of the Kellogg Company, which bakes all the cookies for the Girls Scouts of Greater New York, along with 74 other councils, helped brainstorm a way for the troop (which has hundreds of girls aged 5 to 17) to jump start their own cookie-selling program by setting up a booth at Kellogg’s NYC Cafe in the touristy Union Square area. A large space on the second floor, which is also an insulated environment, now allows girls, who may be affected by domestic violence, to safely sell their wares and raise money for their troop. Customers can buy Troop 6000’s Girl Scout cookies on Friday, Apr. 13, from 4 to 6 p.m., and Saturday, Apr. 14, between 2 and 4 p.m., where 40 girls from six different shelters will be on location. Cookie fans who buy five or more boxes will be able to take home a souvenir Troop 6000 patch. All proceeds from the sale stay with Troop 6000, or you can choose to donate through the Girls Scouts Gift of Caring program. The girls’ initial goal was to sell at least 6000 boxes in honor of their troop’s name, but after reaching their goal Wednesday night, the scouts are aiming to double it to 12,000 by the end of the weekend. In fact, on Wednesday they had to do an emergency restock after completely selling out of cookies. “[The event] really brought out New Yorkers in full force to support the girls,” Jennifer Roth, senior director of business for Little Brownie Bakers, told TODAY Food. The girls also worked with Kellogg's to develop cookie-themed cereal bowls, drinks and a toppings bar, which patrons can purchase through Saturday, April 14, with all proceeds supporting the troop’s activities, camps and field trips. Customers can try new mixtures like Mint-a-li-cious Goodness with Cocoa Krispies and Thin Mints or #GirlsRules with Rice Krispies, fresh raspberries and Trefoil cookies. Troop 6000 hopes to eventually serve 500 girls and women at 15 sites across New York City this year. 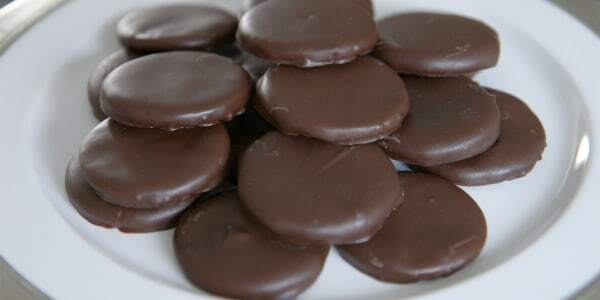 If you miss out on the cookie sales, you can help support the troop directly by making a donation at GirlScoutsNYC.org.